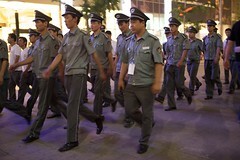 At first blush, the idea that there are more security guards in a country than high school teachers doesn’t seem right. It’s one of those things that, when you hear it, makes you question the values of the country. After seeing the headline, I thought I’d follow the links to see just where the sources came from. It turns out that the source is an academic who, thankfully, included a list of sources. It seems to me that this is perfectly in keeping with the theme of my last post. For a country that’s national defense headquarters spends more money war than all 50 states combined spend on health, education, welfare, and safety, why wouldn’t you also expect there to be a plethora of security guards employed in the country? I suppose the hope would be that there wouldn’t be more of them than high school teachers. Given the decline of US education, I wonder if the US might be better served if they took even one-quarter of the security guards and turned them into teachers. Of course, simply taking away their flashlights and guns and giving them chalk won’t necessarily solve the problem of the US falling behind in education across the world, but with some effective training, they could turn out to be pretty good teachers. I suppose there’s more to it than that, though. Simply shifting one segment of the workforce to another won’t necessarily change the tacit values of the culture that led to this kind of development. That is, as I mentioned earlier regarding the budget of the Pentagon, it might just be that at America’s heart, this is what they value — defense over education. I wonder if there’s a poll out there juxtaposing the two. That is, if citizens were forced to choose where they’d rather have their dollars spent, would the rather it spent on education or defense? Even asking a question like that is difficult given the exposure to the media. In a vacuum, folks might prefer education to defense, but because of the news reports they’ve seen/heard over the last few decades, they’d put their dollar into the defense bucket. One could then argue that nothing really occurs in a vacuum, so that it probably proves nothing. Nonetheless, I’d be interested to see just how many Americans would choose defense over education. I should clarify that I’m not saying that the US should spend nothing on defense, but when you get a certain point, the marginal utility of a dollar spent on education has to be higher than the the marginal utility of a dollar spent on defense. This entry was posted in Education, Philosophy, Politics and tagged Defense Spending, High School, Marginal Utility, Pentagon, Security, Security Guard, Sociological Images, Teacher, Values. Bookmark the permalink. The theme was one of the free ones offered by WordPress (Coraline, as you can see from the footer). I’ve been writing content online for approximately the past 5 years. Hi, interesting blog. Two- way radios, pagers or mobile phone on-site are also available 24-hours dispatch center free random and scheduled patrol supervision to monitor our officers’ performance and enforce our standards of service.